Like most businesses, when you advertise your products or services, whether the ad is online or in print, chances are your company's website address will be included in the ad. While the contents of the site could be great and work fine, to get the most out of your advertising traffic, you should create a landing page specific to each ad. A landing page you can focus the message and convince the visitor to take action on the offering from your ad without all the distractions that your entire website offers. Effective landing pages help increase conversions. Whether you build the landing pages within your website or use a third party company that focuses solely on landing pages, below, I list the essential elements a successful landing page should have. Online advertising campaigns are usually made up of multiple ads (so that you can test and then optimise for whichever is most efficient). Each ad should direct to a landing page with copy that reflects the copy of each ad. The more pages you have for each campaign, the easier it gets to track which group of ads performs better than the others. 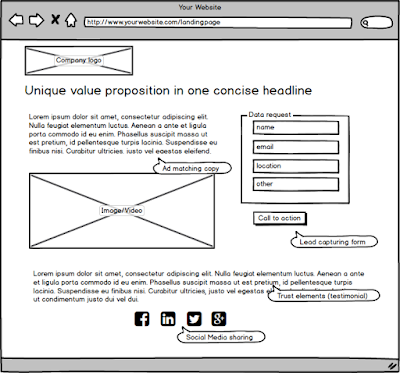 Landing pages should create without your website's main navigation. The content included on your landing page such as video, detailed information and images should be part of it only if they are essential to reinforcing the single call to action. 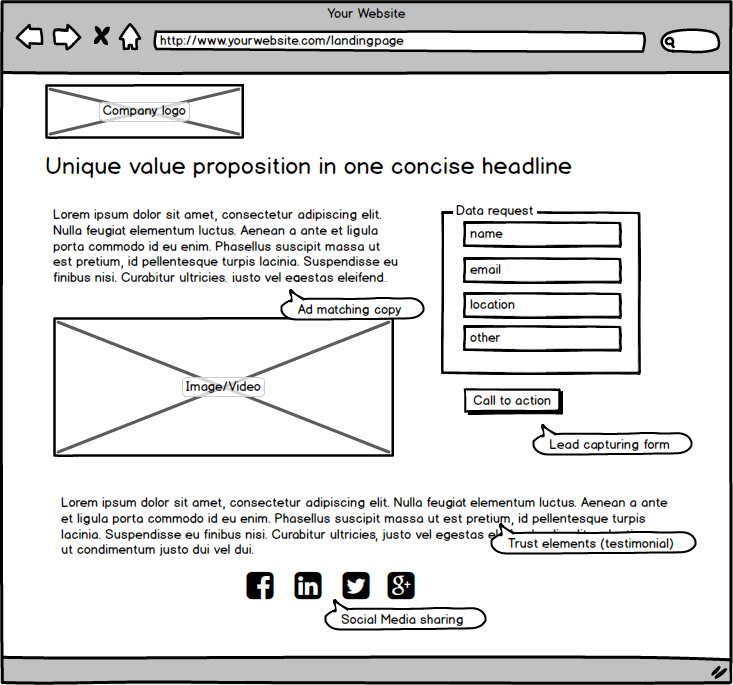 Your landing pages should have a single, clear call to action. In the example here, the goal is for the visitor to fill in the form and request more information. It is why the form is high up and on the right side of the content, so the visitor gets to see it a soon as they land on the page. Make sure your users know what they get in return when they share their contact information with you. Instead of using the default "Submit" on the button use a clear call to action; what you are asking the visitor to do. Don’t worry too much about the number of fields as long as they are relevant for you to generate a qualified lead. Another important element on a landing page is the social media sharing buttons; you want the people to share it with their friends in their networks. Since you don't know on what device the person is using; make sure it displays well on mobile. You might need to shorten your content for the mobile version since it needs to function on a small screen. Make sure it is search engine optimised; the more people find it, the better. Make sure you can track the traffic and conversions to the landing pages. If you are setting them up on your website, most advertising platforms provide codes for tracking Conversions (you need to decide what represents a Conversion). With the help of Google Analytics and UTM Parameters (placed in the links for your ads), you can easily track traffic from each ad to your pages. If you don't have the skills nor the resources to do it yourself, then you need to rely on a third party solution, which comes with all the tracking and analytics to measure your ads and campaign success. Here is a short list of the most popular Landing Pages websites. I still find resitance from business owners on using landing pages; they usually find hard to understand why the public website is not the ideal place to take users from the ads. Their mind changes once they see the results. Landing pages work great any promotion or advertisement where you have a focused call to action. They also allow for A/B testing and help you to separate the general traffic from the ad campaign traffic.